I’ve put together a collection of political cartoons that show government as a bloated, clumsy, and sometimes malicious person. This isn’t because of any special animus, but rather because the unintended consequences of government intervention are almost always harmful. Consider the issue of higher education. Politicians start with the warm and fuzzy notion that it would be good to help more people go to college. So they create loans and grants to help them pay for tuition. Sounds nice and noble, right? And just think of the votes that can be harvested from grateful parents! So is this a win-win situation for both politicians and students? Well, let’s look at the real-world results. As explained in this video, there’s a lot of evidence that these loans and grants are the reason that higher education is now far more expensive (just as there is powerful data showing that subsidies lead to higher costs in other areas as well). And additional research is confirming this concern. A new study by Professor Grey Gordon of Indiana University and Professor Aaron Hedlund of the University of Missouri finds that government subsidies for higher education wind up benefiting colleges and universities and hurting students. We develop a quantitative model of higher education to test explanations for the steep rise in college tuition between 1987 and 2010. …We measure how much changes in underlying costs, reforms to the Federal Student Loan Program (FSLP), and changes in the college earnings premium have caused tuition to increase. All these changes combined generate a 106% rise in net tuition between 1987 and 2010, which more than accounts for the 78% increase seen in the data. Changes in the FSLP alone generate a 102% tuition increase. Robby Soave of Reason reports on the new research. …skyrocketing college tuition costs are the result of all-too-generous student loan policies. The study, authored by Grey Gordon and Aaron Hedlund, used a computer model to measure the effects of various economic forces on college costs. According to the model, no factor had more to do with rising tuition prices than loan subsidies. “Looking at individual factors, we find that expansions in borrowing limits drive 40% of the tuition jump and represent the single most important factor,” wrote the study’s authors. In fact, the “Bennett hypothesis”—the idea, first proposed by President Ronald Reagan’s Education Secretary William Bennett, that increasing student aid encourages colleges to jack up prices—fully explains all the tuition increases between 1987 and 2010, according to the study. …A recent study by the New York Federal Reserve reached a similar, albeit less dramatic, conclusion regarding the link between loans and tuition. Regarding the study from the N.Y. Fed, here’s Robby’s report on that research. The bottom line is that politicians want us to believe that subsidies are needed because college is getting more expensive. 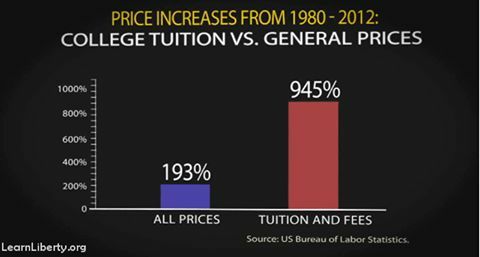 But what’s really happening is that college is getting more costly because of the subsidies! Now let’s move to a separate question. We know that colleges and universities are getting a big windfall as a result of students loans and other subsidies. So how are they spending the money? Not very well, according to researchers. And that’s probably because much of this money is mostly being wasted on more bureaucracy. Here’s a chart showing trends in recent years. Even more depressing, the research also shows that all this spending doesn’t improve human capital, so there’s a negative impact on overall economic performance. P.S. 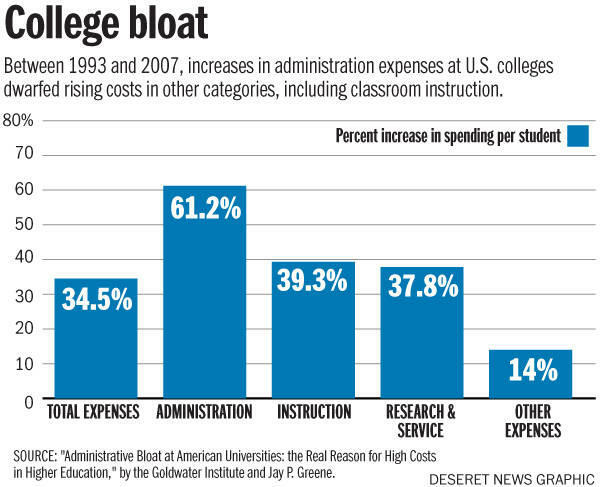 Politicians who complain about “cuts” in spending for higher education are either dishonest or ignorant. P.P.S. Speaking of which, Hillary Clinton’s plan for higher education is a recipe to enable even higher costs for colleges and universities. P.P.P.S. Some folks hope that there’s a soon-to-pop bubble in higher education, which means that tuition will soon become more affordable. 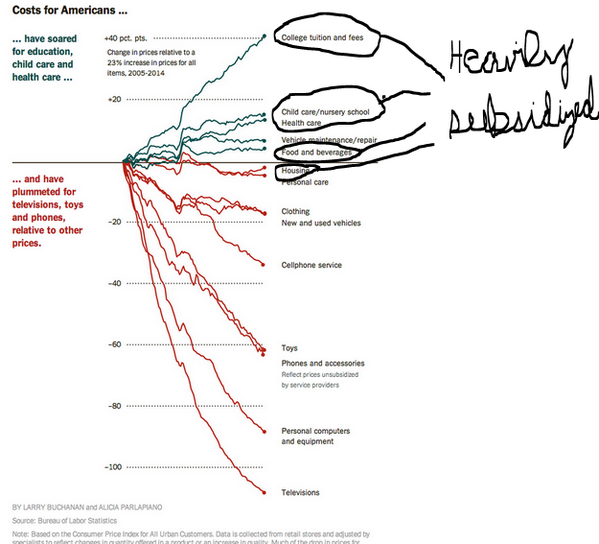 But I’m worried that higher education is more like health care rather than housing, which means that prices will climb even higher over time.